George A. Olah, PhD, was born 1927 in Budapest Hungary. He obtained his doctoral degree at the Technical University of Budapest. In 1956, Olah left Hungary and moved to the US, where he and his coworkers discovered carbocation and hydrocarbon chemistry in superacids. For his discoveries, he was awarded the 1994 Nobel Prize in Chemistry. He is a Distinguished Professor and Director of the Loker Hydrocarbon Institute at the University of Southern California. He has published more than 1300 scientific papers and authored or edited 15 books. He holds more than 120 patents. His current research interests are in the hydrocarbon chemistry and energy areas covering various aspects of methanol economy. He has received innumerable awards and accolades, including the 2005 Priestley Medal from the American Chemical Society. Alain Goeppert, PhD, was born in 1974 in Strasbourg, France. After obtaining his technician diploma in chemistry from the University Robert Schuman in Strasbourg, he received his Diplom-ingenieur degree from the Fachhochschule Aalen, Germany. He then returned to Strasbourg to study the reactivity of alkanes in strong acid systems under the direction of Prof. Jean Sommer at the Universität Louis Pasteur, and earned his PhD in 2002. After this, he joined the groups of Professors Olah and Prakash at the Loker Hydrocarbon Research Institute as a research associate, supported partially by a Lavoisier fellowship of the Ministere des Affaires Etrangers Francais. His current research centers on the transformation of methane and CO2 into more valuable products and CO2 capture technologies. G. K. Surya Prakash, PhD, was born 1953 in Bangalore, India. After his B. S (Bangalore Univ.) and M. S (IIT, Madras) degrees from India he came to US in 1974 and obtained his Ph. D degree from the University of Southern California (USC) under the direction of Professor Olah in 1978. He is currently a Professor and Olah Nobel Laureate Chair in Hydrocarbon Chemistry at the USC at Los Angeles, California. His primary research interests are in superacid, hydrocarbon, synthetic organic & organofluorine chemistry and energy and catalysis areas. He is a prolific author with more than 500 scientific papers and co-authored or edited 7 books. He has received many awards and accolades including two American Chemical Society National Awards in Fluorine (2004) and Hydrocarbon Chemistry (2006). Chapter 2: Coal in the Industrial Revolution, and Beyond. Chapter 3: History of Oil and Natural Gas. Chapter 4: Fossil Fuel Resources and Uses. Chapter 5: Diminishing Oil and Gas Reserves. Chapter 6: The Continuing Need for Hydrocarbons and their Products. Chapter 7: Fossil Fuels and Climate Change. Chapter 8: Renewable Energy Sources and Atomic Energy. Solar Energy: Photovoltaic and Thermal. Solar Thermal Power for Electricity Production. Electric Power from Saline Solar Ponds. Solar Thermal Energy for Heating. Economic Limitations of Solar Energy. Ocean Energy: Thermal, Tidal, and Wave Power. Energy from Nuclear Fission Reactions. The Need for Nuclear Power. Nuclear Power: An Energy Source for the Future. Chapter 9: The Hydrogen Economy and its Limitations. The Discovery and Properties of Hydrogen. The Development of Hydrogen Energy. The Production and Uses of Hydrogen. Hydrogen Production Using Nuclear Energy. The Challenge of Hydrogen Storage. Metal Hydrides and Solid Absorbents. Other Means of Hydrogen Storage. Hydrogen: Centralized or Decentralized Distribution? PEM Fuel Cells for Transportation. 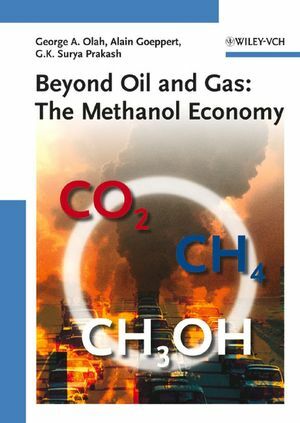 Chapter 10: The “Methanol Economy”: General Aspects. Chapter 11: Methanol as a Fuel and Energy Carrier. Use of Methanol and Dimethyl Ether as Transportation Fuels. Alcohol as a Transportation Fuel in the Past. Methanol as Fuel in Internal Combustion Engines (ICE). Methanol and Dimethyl Ether as Diesel Fuels Substitute in Compression Ignition Engines. Hydrogen for Fuel Cells from Methanol Reforming. Direct Methanol Fuel Cell (DMFC). Fuel Cells Based on Other Fuels and Biofuel Cells. Methanol for Static Power and Heat Generation. Methanol and Issues of Climate Change. Chapter 12: Production of Methanol from Syn-Gas to Carbon Dioxide. Autothermal Reforming and Combination of Steam Reforming and Partial Oxidation. Syn-Gas from Petroleum and Higher Hydrocarbons. Methanol from Methane Without Syn-Gas. Selective Oxidation of Methane to Methanol. Catalytic Gas-Phase Oxidation of Methane. Liquid-Phase Oxidation of Methane to Methanol. Methanol Production through Mono-Halogenated Methanes. Microbial or Photochemical Conversion of Methane to Methanol. Carbon Dioxide from Industrial Flue Gases. Chapter 13: Methanol-Based Chemicals, Synthetic Hydrocarbons and Materials. Methanol-Based Chemical Products and Materials. Methanol Conversion to Olefins and Synthetic Hydrocarbons. Methanol to Olefin (MTO) Process. Methanol to Gasoline (MTG) Process. The “Methanol Economy” and its Advantages.